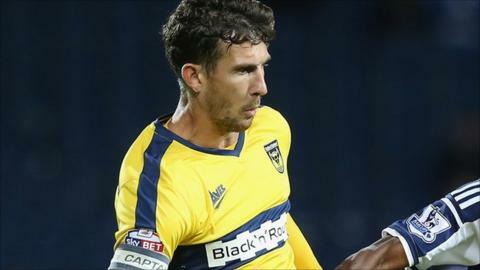 Oxford United captain Jake Wright says the players currently at the club are good enough to turn their form around after a poor start to the season. The U's went down 2-0 at Cheltenham in the Johnstone's Paint Trophy - their sixth defeat in eight this term - and they have yet to win in the league. Wright, 28, believes the players have what it takes to arrest the decline. "I haven't got a problem with the squad, I'm really happy with what we've got," he told BBC Radio Oxford. "You've got to really dig deep from the pit of your stomach when you are on a poor run. We don't look like a side that is lacking confidence. I enjoy watching us play." "Defensively we've got enough to keep clean sheets and win games, and up front we have enough creativity to score goals." The U's face Southend on Saturday and Wright has urged his side to raise their game to earn their first victory of the season. "We want to win as many games as we can and at the moment that is not happening," he said. "We are playing good football, but at the end of the day we have one (point) from 15 and that is not good enough. We need to turn the corner eventually. "We still have confidence and still want to play football the right way."